The second concert in this years Omni Dynamite Guitar series featured the Beijing Guitar Duo. Meng Su and Yameng Wang are the duo players. This was the first time I've seen them in concert, and I was fully captivated by the grace and fluency of their playing from the first notes to the last. Their unity of playing and complete concentration blends together as if they are one player, seamless and united. This must come from their very similar background both in China studies and in their US studies, but more importantly from their own elegance and talents. The ballet of their technique and the waves of their dynamics serves the music and the audience perfectly. I am always most curious of music that is new to me. Meng Su has made a very nice transcription of the Debussy piano 4 hands Petite Suite, which is a welcome opportunity to listen to this great impressionist composer's music in a guitar concert. Also, Sergio Assad's Jobiniana No. 1 and a composition written for them by Elizabeth Nonemaker, Old Habits, Similar Patterns. These are very contrasting recent works, and a delight to discover. I loaned them two guitars for playing the Nonemaker, and was pleased to place them in their hands for this concert. I enjoyed hearing them, they sounded good. Both played solo sets as well, Yameng played Barrios, Meng played Tarrega, each of them very good soloist, nice music, all good. The Beijing Duo is living in Baltimore at this time, and some concert appearances are listed on their website, beijingguitarduo.com. Go see them when you get the chance. Very beautiful, very satisfying. With Meng Su and Yameng Wang. Meeting Johannes at the airport in Shanghai. and celebration dinners. This was sponsored by my partner and dear friend Alex Wang, marking 10 years in business together with this celebration tour featuring one of my favorite guitarists of all time, Johannes Moller. If two months seems like a long time to getting around to blogging about events, it's because it's taken me a while to digest the impact on my outlook and priorities. I think back to around 1975 when I attended the very first Carmel Classical Guitar Festival. As far as I know this was the first classical guitar festival in the USA. Before that I had no idea that there were other like minded people attracted to the sweet sounds of the guitar, at least not so many. There was a special moment in the middle of the festival, on a Friday afternoon at Sunset Center Theater. Richard Stover was giving a lecture with slideshow and recorded examples of guitar in Latin America. He was introducing names and sounds like Barrios, Bonfa, Falu, but the one who really shook me up was Leo Brouwer. He played a recording of the Eternal Spiral as played by Brouwer, and my mind cracked open wide. I finally heard visionary music played on the instrument that I loved, and I knew that anything was possible. Backstage before the show in Shanghai. Plenty of food and drinks! compositions, at least in the way that it has touched me. Now, since Johannes has been playing many concerts on my guitars, I have heard him often and continue to be moved by the power and immediacy of his compositions, and the presence of his playing. Over the 40 years of my career in the world of classical guitar I have heard many spectacular, inspiring players and moving music. What I long more than anything is creativity, imagination, adventure and personal expression in music. I've been lucky to experience this in many ways, and Johannes is the complete package. He is a virtuoso on any terms, but his ability to reveal such a mystical and passionate musical world through his own music writing is a very personal inspiration, and I love him for it. A full house at Johannes' concert in Guangzhou. I have always advocated for a whole approach to the guitar and its music, this is how I became a guitarist, a composer, and a guitar maker. I appreciate hearing anything new exploring the possibilities of the instrument. I have a special affection for idiomatic classical guitar music that rises from of the instrument, and expands in smart and creative ways. Johannes is a great interpreter and performer, but it is his ability to put himself out there as a creator is most exciting, truly unique, and I think he really is just getting started. and lows of life on the road are crazy, and we definitely shared many of those things on this whirlwind tour of China. I got to listen to his program, every night in a different city, played on my guitar, and got to know and appreciate the music more and more for all the repeat listenings. 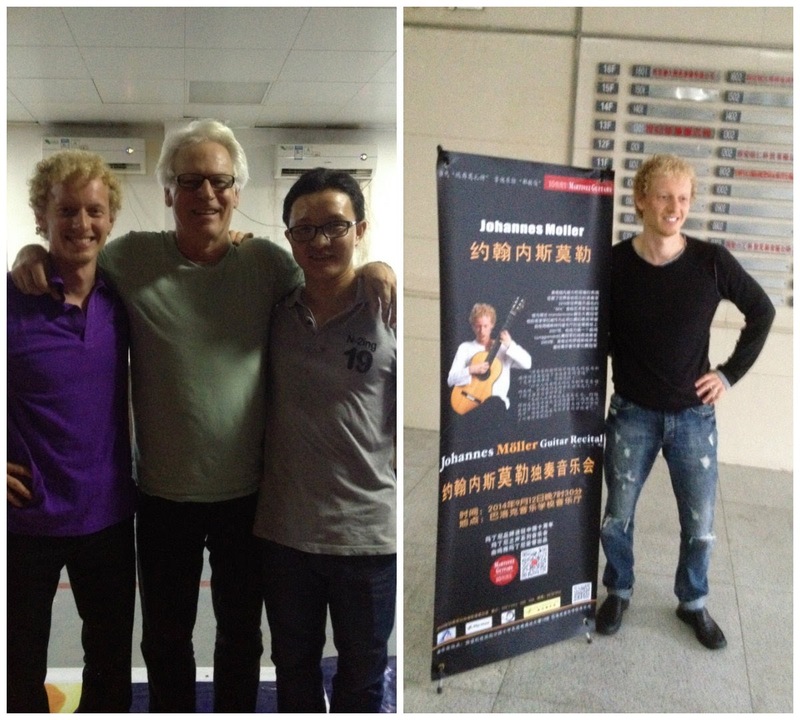 I watched the response of the Chinese audiences hearing Johannes' music for the first time, loving it and wanting more. It was a break-through tour that is bound to lead to many opportunities in the emerging Chinese audience, for Johannes and for classical guitar. And it was a powerful personal reminder of the first purpose, the reason for all of the hard work that goes into guitar study, in the workshop, in business, and on the road; it's the music, and all the transcendent moments that music is responsible for. Johannes poked me, pushed me to remember. This has always been true, and it's still true, now more than ever. Johannes and I with our tour manager, Joshua. A very successful tour! Iphone video of "Night Flame"
From Venezuela to the U.S.! Carlos Aurrecoechea is a fine guitarist from Venezuela. Last year, after a few months of correspondence he ordered a high end Signature guitar, a sight unseen. Because of very difficult political and economic policy issues in Venezuela it was very complicated for him to get "permission" to buy this guitar from the US, and an even greater challenge to manage the financial challenge from there. I was quite touched that he had the confidence to go through with this complicated and potentially risky transaction, I still don't understand all the barriers that he had to overcome. We made the guitar carefully and the best possible, and when it was done we held onto it until he was able to arrange travel to California to pick it up, he didn't want to rely on shipping, and I don't blame him. It's an interesting phenomenon that a guitar like this actually seems to improve and mature even when it is just waiting, not even being played. Something happens, it matures, settles in, cures — I can't really explain it, but I have seen it many times. So when Carlos arrived this week to pick it up, the guitar really sounded amazing. Exceptional. It was good from the beginning, but after chilling for months it sounded even better. His playing is beautiful, I'm delighted that he will be playing it a lot in Venezuela. There seems to be a very strong and passionate guitar scene in Venezuela, and he is in the heart of it. It was really great to finally meet him and I'm grateful for the trust he had in the process.